Warning: The following article contains spoilers for the first seven episodes of HBO’s Game of Thrones. But really, if you haven’t caught up by now, you should probably get off our website and back to bingeing it, because The Premiere Is Coming. Winter has come, the Wall has fallen, and the dead march on Winterfell in the final season of HBO’s Game of Thrones. But, if you’re the type of person who wants to watch the eighth season of the award-winning show as soon as freaking possible, thank you very much, then you likely already know all that. 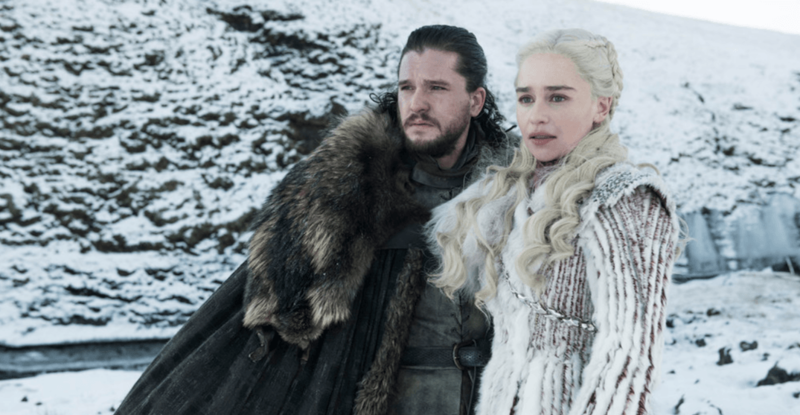 What you may not know is how to go about watching the GoT’s final six episodes without resorting to some terrible Twitch stream or, even worse, having to wait until the episode ends to find a suitable torrent (which we do not condone doing because it is super illegal …and also means you could potentially be spoiled in the time it takes to wait for the download to complete). Well, fear not, brave Westerosi Daily Hive readers, because we’ve found a solution that will have you watching all of your favourite characters die in crystal clear HD AND in real time. It’s no secret that Bell has had something of a stranglehold on HBO in Canada, which, until recently, meant that the possibility of streaming their shows was (and still is, honestly) an impossibility through HBO Go — a glorious bastion of light that only our neighbours to the south get to enjoy. HOWEVER. In 2018, Bell Media made the decision to finally include Game of Thrones to their stand-alone streaming service Crave — though the initial decision was just to provide the previous seven seasons. 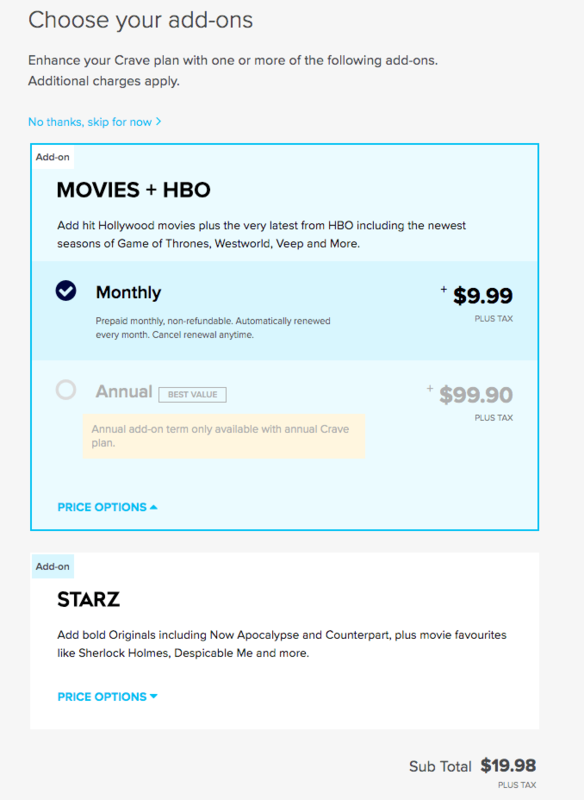 An update later in the year added the option to watch new programming as it was released, including GoT, though regular Crave subscribers would have to ante up another $10 a month to purchase the Movies + HBO add on — bringing the total to $20/month. 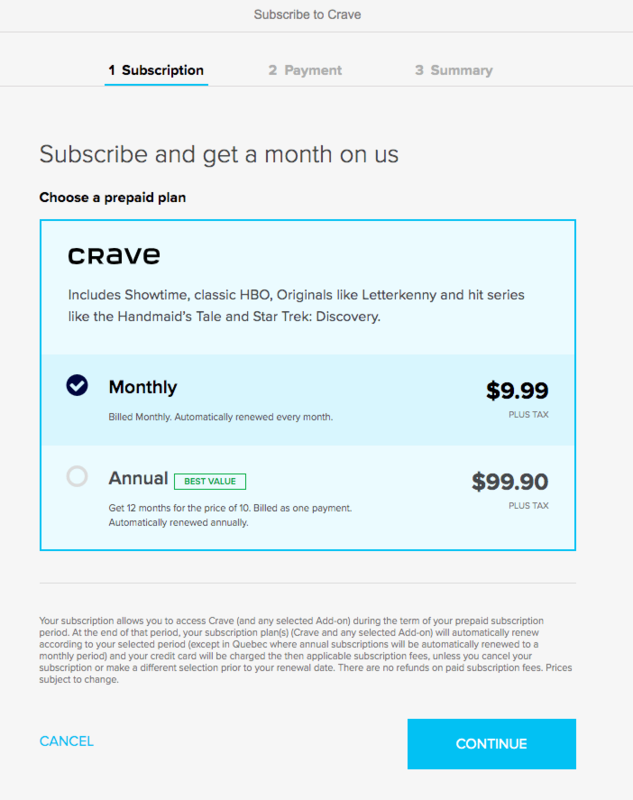 As it currently stands, new Crave subscribers can sign up online for a monthly subscription that will run them a total of $22.38 a month after tax — which just so happens to include a one-month free trial. Let’s lay out the numbers, here. Say you sign up for the free trial on the day of this weekend’s April 14 premiere. You’ll be able to watch around three to four of the new episodes through the one-month free trial (depending on if the trial ends at midnight or the exactly one month after you signed up), and then you’ll have to pay the $22.38 for May 2019 in order to legally live stream the final two episodes. If you plan on signing up for just the next six weeks, make sure to click the monthly payment option instead of the yearly, or else you might be out of luck on that post-GoT cancellation. 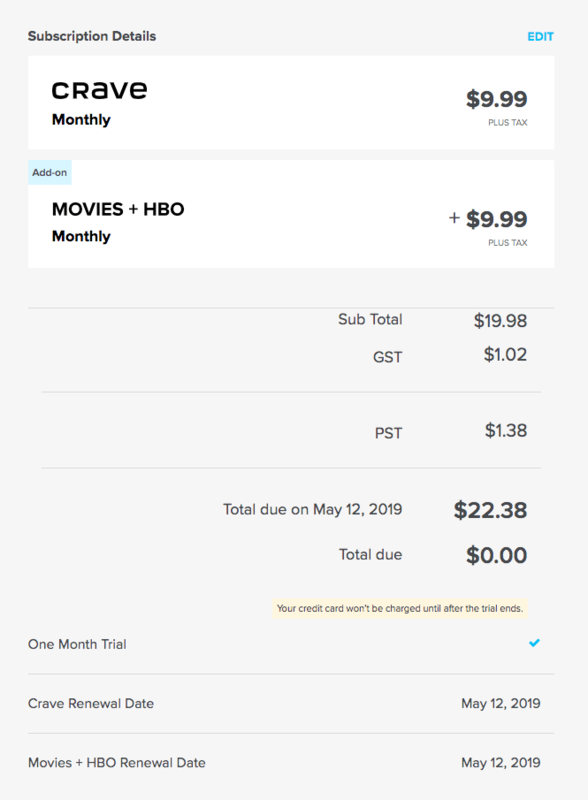 Yes, you will have to pay just over $20, and yes, you’ll need a credit card to sign up to the service, but given that this appears to be the only way of legally watching the climactic season of Game of Thrones in Canada (well, barring through a legitimate cable TV subscription, but who even has those anymore?) we’d say it’s more than worth it. Valar Morghulis, dear Watchers On The Well-Worn Couch, and may the rightful king Podrick Payne rule the Iron Throne for many years to come.